We all know that camping is one of the best ways to enjoy the great outdoors - but many of us miss out on the amazing opportunity due to the hassle of having to get everything together. Glamping - the mix between luxury and the outdoors - is the perfect solution to getting outdoors without the stress of planning for a camping trip. We have compiled a list of our 9 favorite glamping airstreams in the U.S.A. for you to book your next adventure to. Now all you need to do is pack your bag and head on out! With 4 newly renovated modern airstreams located in the heart of the desert, Joshua Tree Acres is an experience you don’t want to miss out on. 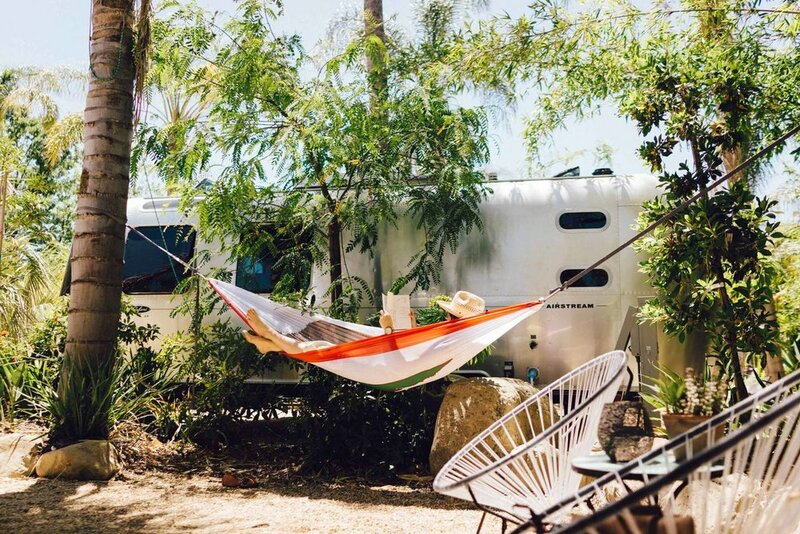 Each of the 4 airstreams has a unique bohemian feel along with their very own porch and swinging hammocks to enjoy all the peace and serenity Joshua tree has to offer. Although the airstreams do not have their own bathroom inside, each guest will have access to shared restrooms, a hot tub, a seasonal cold plunge pool, clawfoot bathtub, outdoor shower, outdoor kitchen, communal table and fireplace inside the clubhouse. Enter the chance to win a 2 night stay for you and a friend here! Sitting on 7-acres of farmland among forests, trails, and streams is this secluded 1977 Vintage Airstream. With an outdoor Japanese soaking tub and shower, you will feel as though you are truly one with nature. Not to mention, there are so many surrounding outdoor activities to take up your time such as exploring the Appalachian foothills, lakes, rivers, or just relaxing on the large private deck looking out into the trees. You can even visit the owner’s small farm to hangout with their Great Pyrenees, chickens, and three goats. P.S. be sure to keep an eye out for the Barred Owl that live in the surrounding area! Located just 10 minutes from Downtown Santa Cruz and the beach boardwalk, this glamping experience is sure to leave you refreshed from the moment you check-in. It’s the perfect location if you are looking to enjoy the great outdoors, but also be able to drive over to the beautiful city that is Santa Cruz. Fenced in on the owner’s property is the luxurious airstream open to a hillside full of nature - yet secluded enough for your own personal privacy. Located on 21 acres of land, this nomadic hotel and campground in Marfa, Texas is a hippies paradise. With El Cosmico’s belief that this campground should be a mix of adventure and do-nothing, they have created the ultimate relaxing getaway. For $85, you and your friends can rent one of their wood-fired dutch hot tubs. Each trailer even comes equipped with AC and heater, refrigeration, basic cooking supplies and a radio with bluetooth connectivity from your phone. Featured in LA Weekly as one of the most creative vacation rentals in Los Angeles, this vintage 1969 Globetrotter airstream can be found elevated 1,400 ft above sea level. Although it’s 50 years old, the inside has been stripped and renovated for a luxurious stay worth the price. From your very own spacious deck, there are views all over Los Angeles including the Hollywood sign, canyons, and downtown Los Angeles. Not to mention it is tucked away in a quiet neighborhood to make your stay as relaxing as possible. Located 5 minutes from the beach, these luxurious airstreams are your perfect beach getaway. With it’s modern interior, you are provided with a true glamping experience - especially with the private grassy yard which is perfect for letting your furry friend roam around! It even comes equipped with an outdoor shower, grill, fire pit, picnic table, and chairs so you can spend your days and nights enjoying the outdoors. Choose from 7 different airstreams located in the same area to see which best suits your needs! Walking distance from 7 wineries, these airstreams are meant for wine lovers from all around. With your own private deck, you can have a personal wine tasting experience right outside your very own airstream overlooking the heart of the beautiful Temecula Valley Wine Country. Sitting on 2.5 landscaped acres, this airstream has it all - shared pool, stocked kitchen, private deck, outdoor seating, grille, and much more! Don’t forget to leave your children and pets at home because this is an adult-only airstream! If you’re looking for a camping experience without the planning - then head over to Olympia, Washington to experience this beautiful waterfront airstream. With kayaks, paddle boards, and a paddle boat available for use on property, you will never run out of things to do while camping. The prime waterfront location gives you a view that is worth the price itself. There is even a Jacuzzi to take a warm dip in after you tire yourself out from exploring all that Washington has to offer. 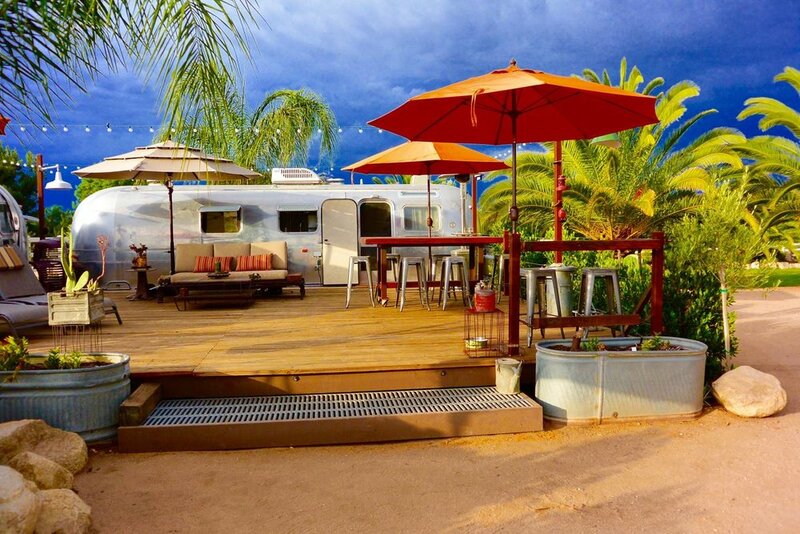 Relax and unwind in 1 of Caravan Outpost’s 11 available airstreams for rent in Ojai, California. Each airstream comes equipped with its very own refrigerator, AC, heater, toilet, and shower so you don’t have to to share with the other visitors. You can even bring your furry friend along with you on the trip, just be sure that you book one of the “pet friendly” airstreams since not all of them allow animals. If you’re coming to Caravan Outpost for a relaxing trip, don’t forget to checkout their relaxing amenity packages such as wine tasting, massages, yoga, hot springs, and meditations. I you’re coming to experience an adventure, there are options to go mountain biking, rock climbing, trail running, or hiking. Whatever you’re looking for - they have it for you! Glamping is an awesome alternative to camping for whenever you want to enjoy a trip to the outdoors without worrying whether or not you packed all of your essential camping gear. so next time you decide to go glamping, don’t forget to check out our 9 favorite airstreams!